A new docudrama on NETFLIX: First They Killed My Father. I was so instantly depressed by it, I turned it off. However, because it is so obviously well-made, I must continue watching. It is SOOOOO PAINFUL TO WATCH!!!! As certainly as the Third Reich and WORLD WAR II happened! Out of my unexpectedly powerful grief, something must be created! It already has been, Michael! Not only its history is readily available on Wikipedia, but the film, Killing Fields, was produced. And now, First They Killed My Father. Need anything more be said?! Our helplessness before such horrific acts! Our helplessness before even the history of such nightmares!! All because of Man’s Free Will. God wants to be freely and authentically loved by Mankind. Without Free Will, that authenticity could not exist! Despite the Hell that Man’s Free Will has created, it couldn’t be constructed any other way. I certainly wouldn’t want it any other way. To live a slave to God, rather than a vibrantly free lover of God?! 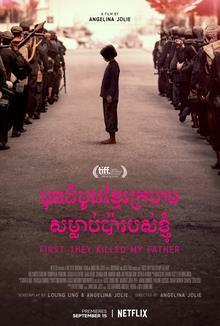 I’m back to watching First They Killed My Father. Like watching an entire set of highway collisions about to happen. There is nothing you can do about it! The children count the days of their eviction from their homes. Evil such as the Khmer Rouge and Kim Jong Un’s North Korea make war an absolute necessity! The human race would not survive if tyranny were not resisted! It’s the most horrifying film I’ve ever seen! Because I know what this entire nation is about to face!! The film appears to be seen entirely through the eyes of the young daughter. All Cambodians are poor except for the Khmer Rouge Army which steals everything that the people once owned, including their own lives. The Khmer Rouge is fiercest with the Buddhist Monks! Forces them immediately into slave labor. “Angkar”, “The Organization”, an alternate name for the Communist Party of Cambodia, rules. I now learn that this extraordinary film was produced by the actress, Angelina Jolie. It is based upon the memories of Loung Ung, the daughter of a government official prior to the coup-d’etat by the Khmer Rouge. Ms. Ung wrote the story of “First They Killed My Father” and portrayed it as an experience seen through the eyes of a five-year-old girl, which was exactly how old Loung Ung was when the Khmer Rouge took power. Knowing how horrible the story will be, one tends to give up on seeing it because of how depressing is Cambodia’s fate during those years. It was, however, exquisitely cast and produced by Ms. Jolie and created by an extraordinarily gifted assembly of artists. It is the strongest reminder of just how horrible the human race can become, but also how indomitable the goodness of humanity actually is. It proves that Love between human beings is ultimately INDOMITABLE! Basically the Khmer Rouge are attempting to tell God, our Creator, what His creation is all about. They are, as Hitler was, and Stalin was, and what Mao Zedong will inevitably be proven to have been: godlessly sadistic tyrants. Will such men ever stop appearing on Earth? Only if they are sent eventually to another planet and kept there. Then, of course, there will be Star Wars! The planet Earth will have become Man’s one, sacredly great hope for the future of the human race. Despite the increasingly Marxist and Muslim historians amidst the embattled Free World, Human History will actually become that simple. Communist Islam will, indeed, be an inevitable alliance that, as with all tyrannies, be defeated on Earth. As soon as another planet in the Solar System becomes inhabitable, the enemies of a Sane Human Race will race to occupy it. The Earth, in its entirety, then becomes a United States of the World. The Declaration of Independence, the Constitution and its Bill of Rights will become the governing principles for the entire human race. That, for myself at any rate, appears to be an inevitability! A permanently defining event that begins as a Second Civil War in the United States. The treasonously bipartisan campaign to create a “Progressively New World Order”, one to be run by the United Nations?! Despite its present power and influence, the NWO will lose. The Declaration of Independence, the Constitution and its Bill of Rights will win! Right now, only God knows how. We, however, shall learn how. It’s the next day and I’m still, in very small segments because that is all I can take at one time, watching First They Killed My Father. The title alone forever tells us what is coming… and then leaves us in suspense about what is coming after that! Seen mainly through the eyes of a five-year-old child?! All our nerves, like those of a child, are on alert!! And all the captives are being slowly starved to death. The father does his best to feed his children. Most likely because of that and because of his humanity, the father will be executed!! I have never, throughout an entire movie, wept so continuously. The excruciatingly sensitive face of this child and the other children who are suffering in fear and growing starvation. We, the audience, become children ourselves. The citizens of North Korea are living in terror of their psychotic leader, Kim Jong Un, who is now attempting to keep America and the entire Free World within increasing fear of nuclear war. The secret to the power of this film?! No self-pity on the part of the victims! Only a sense of growing shock that Mankind could be this cruel. Even the single tear that begins to fall from the eye of our child heroine, it descends over her cheek as if over frozen ice. A PERMANENT AND ETERNALLY INERADICABLE VILLAINY!!! THE EVIL OF THE KHMER ROUGE, LIKE THAT OF THE NAZIS, STALINISTS AND MAOISTS, SHALL NEVER, TO THE END OF TIME, IF THERE IS SUCH A THING, EVER BE FORGOTTEN.